I was able to make a trip to Israel at the beginning of the year. Now, I recommend that everyone put the Holy Land on their travel bucket list. But sometimes getting to the place where Christ lived and died is impossible. Maybe you don’t have the vacation time or the funds to travel. Your health may keep you from making the pilgrimage journey. But thanks to the writings of Father Sertillanges, you can gaze in silence at the crib in Bethlehem. As you read the words of this book, you can hear Jesus call the fishermen. You can even feel the chill of Golgotha as it looms ever larger in Christ’s mind! Looking for the perfect book to pick up this Lent? 33 Years in the Holy Land is a great place to start! You can get a copy from your local Catholic bookstore or online through Sophia Institute Press. Here’s a preview of three of the places you’ll journey to in the pages of 33 Years in the Holy Land. “In the day of Jesus, Bethlehem is the morning—the fragrant freshness of dawn, the first smile of Heaven, the gentle breeze that exhales new life and gives forth perfumes rich and rare, such as we dream of when contemplating the first fair paradise where man was made,” Father Sertillanges writes. Bethlehem was where King Solomon lived. The reservoirs that he built still exist. But even today, centuries after the time of Solomon, the town has something for pilgrims. The Gospels don’t have much to say about Nazareth. The town is shrouded in mystery and silence. But it’s there that Christ spent the first thirty years of his life. “When one arrives there, the spirit animated by memories, and the soul filled will the personality of Jesus and his hidden life, which is but suggested to us in the few words of the Gospel; when one considers what he was and what he is, the terrible mysteries locked up in his soul the eternity of his existence, the infinity of his work, and the immensity of his name, one pauses in reverent awe,” the Dominican priest explains. Christ’s life on earth was a short thirty-three years, and his home during his earthly life was a small place compared to the enormity of the universe. 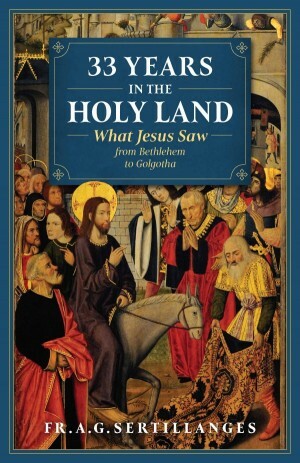 “In fact, may we not confine the theater of the preaching of Jesus to a still smaller place and say that the true birthplace of the Gospel was Galilee, and the lake known as the Sea of Galilee,” Father Sertillanges writes. This lake is incredible dear to the Christian soul. Want to experience Lent, Holy Week, and the celebration of Easter like never before? Pick up a copy of Father Sertillanges’ book from your local Catholic bookstore or online through Sophia Institute Press today!